Azure Ray at The Slowdown, Nov. 3, 2010. The duo is headed to China in a couple weeks. If like me you’ve been wondering what Azure Ray has been up to, well, the duo of Orenda Fink and Maria Taylor are headed east, as in the Far East for a tour of China. If you’re in the area, drop by one of the shows! Seriously, I didn’t even know the duo had been playing together. The last release I’m aware of was EP As Above So Below, released on Saddle Creek Records in 2012. 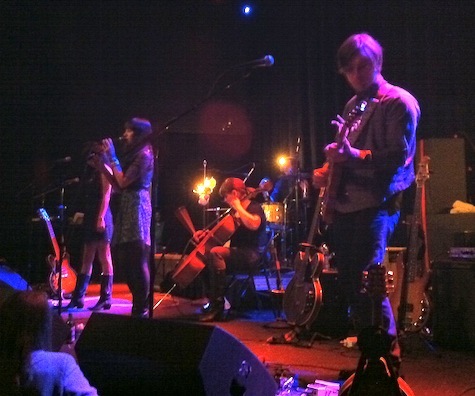 Their last live show was a reunion gig at Lodge Room Highland Park this past Jan. 20. BTW, this is not the first Asian tour for Azure Ray. The duo played China and Taiwan back in 2013. Speaking of Saddle Creek Records, the label today announced that it’s signed Tomberlin a.k.a. Sarah Beth Tomberlin. Her debut album, At Weddings, was released as part of Joyful Noise Records’ “White Label Series” last October. Saddle Creek is re-releasing it Aug. 10 with three new songs added (pre-order here).